No other country in the world celebrates the winter season quite like we do here in Canada. 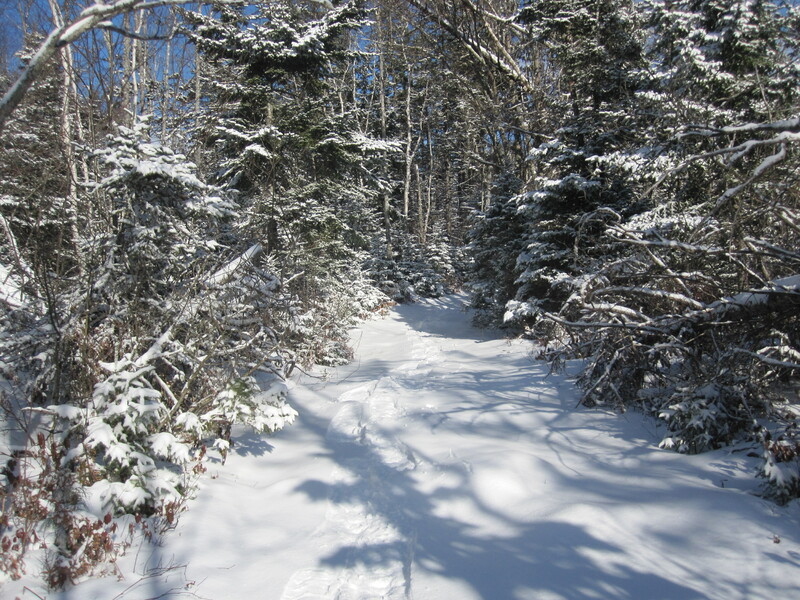 Although in Nova Scotia we don’t usually accumulate a lot of snow, when we do you can be sure that people make the best of it. Having said that I felt I deserved to get out and play for a while in this winter wonderland. For once the weather predictions were right, calling for 10cm of snow. Most times when they call for this what they really mean is 5cm of snow and 5cm of rain, but that’s life on the Atlantic. Oh yeah – nice fresh snow to play in. Having recently moved to a new area I was eager to explore the woods near my property, and boy was I glad I did. Not far from my house is a set of trails that venture through the forest, following alone side a gentle river to a number of lakes. I strapped on the old snow shoes and away I went, trotting up the trail with ski poles in hand and camera gear on my back. Most of the surrounding trees were slumping over slightly from the weight of the fresh snow that had just fallin. There were a few flakes still flying about the cool crisp air. The river was only partially frozen, mostly around the edges and small raft of ducks gathered in the open water, going about their business and not bothered in the slightest by the snow and ice. Coming to an intersection in the trail I had a choice to make, continue trucking straight ahead or up through the woods to the left. I decided the trail on the left looked more interesting and having researched a map of the area earlier in my van, this trail could very well lead to a small lake. A sharp shinned hawk sat among the trees enjoying the warm of the midday sun. Up the trail I went and after a 10 minute climb the trail leveled out and the sounds of the ducks and river had all but vanished. Before long I could see the lake through the trees. By this time the clouds had parted, the sky a deep blue and the sun glistened down on the lake – reflecting each particle of snow like a million scattered diamonds. On my way back I took a turn on a trail that dipped down into a ravine which I figured connected with the trail I seen earlier which would get me back to my van in no time flat. That was a good idea. I just descended into the ravine and to my surprise there lied a cave to my left. After getting back home and doing some research, turns out it wasn’t a cave but rather an old gold mining shaft. None the less it was COOL and I was going in. 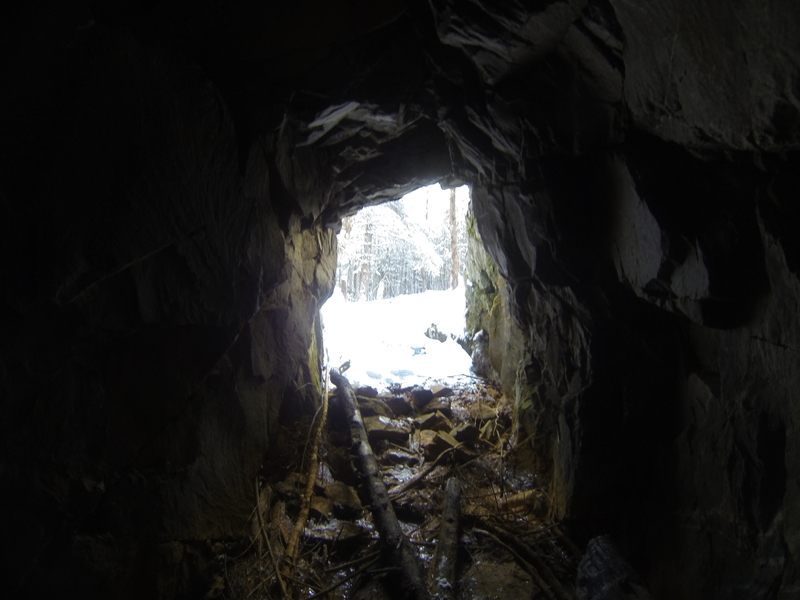 Snow shoes came off, flashlight turned on and into the dark cavern I went. Abandoned mine adit along the trail. The cave was no more than 15 ft deep but completely pitch black once half way in. I wasn’t the only one in the cave at the moment. Hanging from the ceiling were 2 small Brown Bats – clinched together for warmth and catching some much needed sleep during the day light hours. Back at the van I thought to myself we are probably in for a great sunset. Later that evening I went to the Salt Marsh Trail which is also in the area, and captured this remarkable shot. Just goes to show that it pays off to explore your own back yard. I really enjoyed the video and was quite surprised that it wasn’t far from your backyard home. If it really looked beautiful in winter (reminds me of the Ansel Adams photos), imagine how it would be in spring or summer… must be fantastic! And this is one of the many reasons I love Nova Scotia. Thank you for sharing it with us. PS. I’ll let you know when I’m ready with the paintings. Cool. This looks absolutely beautiful. Keep exploring your new surroundings!